Another vector! Took a screenshot from FMA. It's at the begining of the outro. Winry just looks so cute and innocent...So, I ended up vecotring the entire thing pretty much. First Winry, then the bed. The background isn't really..."vectored" I suppose...but whatever. Hehe...if you look at the pictures...one of them is the corner of my head. Thought I'd put that in for kicks and giggles..
Winry from FMA! The crazy metal person! Crazy bg man. Somehow, I never really like vectored work. No offense dude. clearly wallpaper =) nice work!! this vector job is amazing. I love the way she looks in this wallie!the pictures lying on the floor are a great touch! Thanks to you and the many other artists her in MT, I'm enjoying vectors much more than I used to, it's so cute, nice work. I've always wanted that pic from the ending!! Thank you soo much,very nice!!! That looks so cooooooooooooooooooooooooooooolllllllllllllllllllllll!!!!!!!!!!!!!!!!!!!!!!(...) Keeeeeeeeeeeeeep upppppp the goooooood work!!!!!!!!! And if you could, make more Winry Rockbell's wall paper. Hee hee... Niiiiice..... I really like this one. Keep it up, yo!! 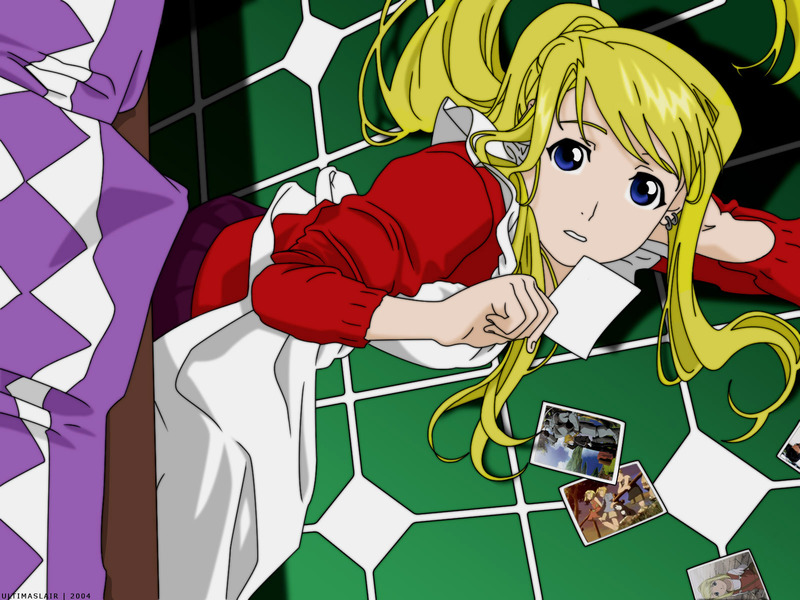 Wow it's a wallpaper of Winry Rockbell at Las Vegas? heheeh I like it. yeah love the scan, love winry <3, thx. wow really amazing pic.........really gorgeous......i can see what u mean.......winry just looks so cute and innocent in this particular picture.....so kawaii!!!! !......really cute......thanks so much for sharing this pic with us!!!! !...thanks thanks thanks thanks!